Let’s pay a visit to The Beachcomber, at the May Fair Hotel in the fashionable heart of London. The Beachcomber opened in July 1960, and was the creation of the Danziger brothers, Edward and Harry. They were New Yorkers and film producers who had moved to London and purchased the historic May Fair Hotel. Both the film industry and tiki bars share the importance of storytelling, just-so lighting, and set design; it’s not a strange leap that these Americans brought Polynesian Pop with them when they crossed the pond. In the hands of the Danziger brothers, Tiki landed in the U.K. in a big way, and it was incredibly successful: The Beachcomber opened years before the London Trader Vic’s opened (just a few blocks away), and the Butlin’s chain swiftly nicked the whole concept, name and all, from the May Fair. Less talking, more tiki. Sit down and watch this British Pathé film, shot at The Beachcomber in 1963. It’s only four minutes, and every second is a dream. Full screen it. Get out your headphones, you’ll want to hear the soundtrack. It’s hard for people today to understand that in this golden era, Polynesian restaurants were a high-class evening out. The Beachcomber in London is a great example. These places were fun, they were goofy, they were silly—but make no mistake, they were fine dining, with great attention to the details of service, food, drink, and presentation… and the environment was the first and most important gift to the guest. The way to really deliver in this world of tiki is to give more, never less. The world has no shortage of Milquetoast environments, what it needs is more people willing to go all out for their guests; that is the power and potential of tiki’s legacy. 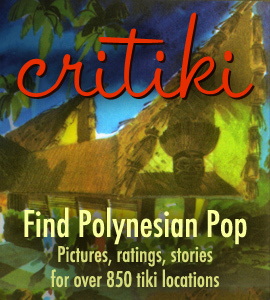 Critiki has a new postcard and matchbook from The Beachcomber, thanks to Critiki member Dustycajun (he’s also the one who pointed me to the Pathé film of The Beachcomber). Mahalo, Dustycajun! Something interesting to note: compare the brightness of the postcard with how dim and moody the film footage is. For both the film and the postcard, they brought in bright lights to capture these places on camera. You can even see stark shadows cast by the tiki at the rear left, and on the salt and pepper shakers on the table at the front left: those are from high-wattage standing lights brought in by the photographer. The postcards are always much, much brighter than the restaurants were in real life. Want to see some more film footage of the Beachcomber? British Pathé also has 10 minutes of outtakes from the shoot.